Everyone has pill bottles lying around the house, but why are you letting them pile up? Worse -- why are you tossing them? These tiny little bottles are kidproof, waterproof, and their bright orange color also makes them easy to spot. Are you starting to see where we're going with this? These little bottles can actually be repurposed in a dozen ways to organize your life, and at the very least, make it a little bit easier. After reading this list, you're going to wish you'd tried these tips and tricks sooner! Check it out and let us know what you think. This is an awesome tip for traveling because you will always keep your jewelry together -- instead of rolling around your bag -- and it will always be easy to find in that orange bottle. Why go out and buy those tiny little shampoo, conditioner and bodywash containers when you can just fill up an old pill bottle? The Beauty Blog points out it costs nothing and is secure and easy to use. If you're the type of person who always seems to snag something or lose a button, this is for you. From Glitter to Gumdrops says to fill a pill bottle up with some thread, maybe an extra button and always a few needles. If the (unfortunate) occasion arises, you'll be prepared! Need a good hiding spot? 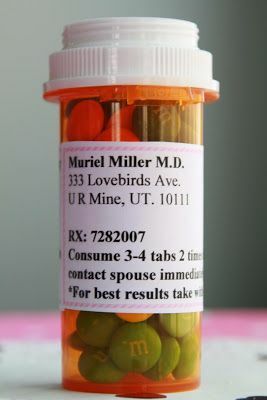 Instead of searching around for one, glue a rock to the top of an old pill bottle and place it in the garden or a pot. This one is sure to go unnoticed by burglars. No, we're not talking about the camping kind. This little survival kit is perfect to keep in your purse, gym bag or even at the office in your desk. Survival at Home says you should fill it up with bandaids, antacids, ibuprofen, sewing needle and thread, an extra button and everything else you can fit in there. If something happens, you're sure to have it close by. Nowadays you can buy those handy but expensive nail polish remover pods. You stick your finger in the remover, wiggle it around a little, and before you know it all your polish is off. 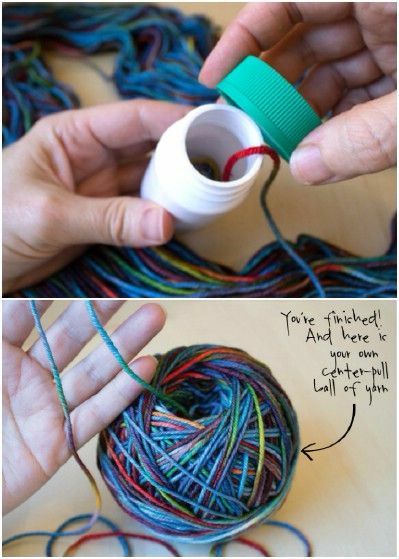 Well, Quick and Dirty Tips says you can make one out of an old pill bottle by filling it with cotton balls and remover -- that's it! There's no need to go out and buy an expensive center pull for wrapping your own yarn. Instead, I Always Pick The Thimble says you can stick the start of the yarn in the pill bottle, put the cap on, then start wrapping. It creates the natural gap you need and it's totally free! 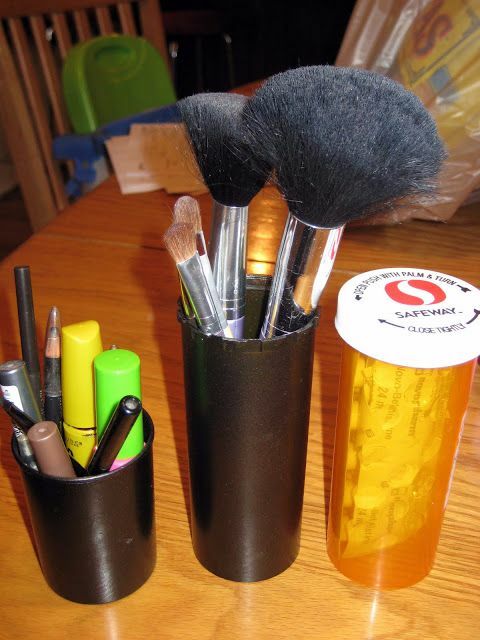 Paint the pill bottles a pretty color and fill it up with makeup brushes, Q-tips, whatever else will fit. We love how Laura, the blogger over at Laura Thoughts, made hers magnetic and stuck it to a board to keep organized. Okay ladies, this is just about as genius as it gets. Mod Podge Rocks decorated an old pill bottle then tossed it in her purse to collect things like old receipts, wrappers, and anything else that tends to just end up floating around. Cleaning your purse is going to be so much easier next time. One thing we can all agree on, without a doubt, is how annoying it is to untangle earbuds. Losing them in a tangled mess at the bottom of your bag comes at a close second. Instead, knot them up and throw them in a pill bottle. The chords stay neat, and you'll always be able to find them. This is just a cute little way to cheer someone up or show them how you feel. We love how Cook Bake and Decorate created this adorable little instructions section on hers, too. So sweet! Well, more like match-cylinder. 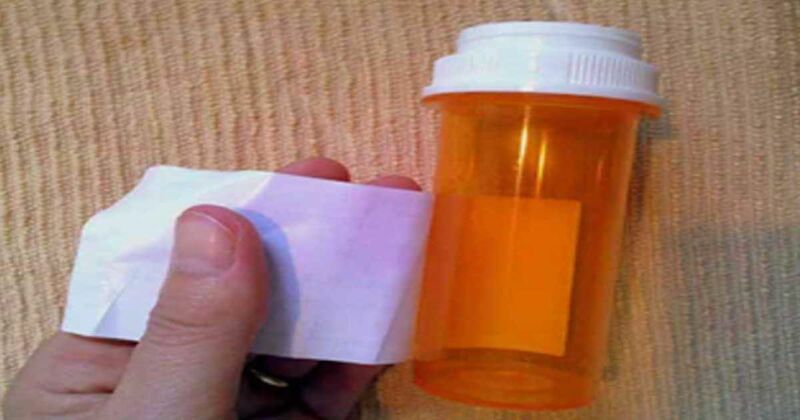 Simply fill the pill bottle with matches and tape a strike to the outside (or stick it with the strike facing outwards inside the bottle). The Crafty Librarian says doing this makes a waterproof and kidproof match container. Perfect for camping or to keep in the car in case of emergency. Don't forget to share these handy tips with your friends on Facebook, Twitter and Pinterest! Windex isn't just for windows anymore!